Blowout Sale! 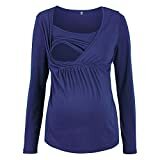 Up to 69% off on Maternity at Kollaboration Chicago. Top brands include iNewbetter, Ekouaer, Oliveya, MAXMODA, Amazing Speed, Laiwei, Motherhood Maternity, Foucome, Dokotoo, Regna X, Mordenmiss, Hellmei, Daisity, Beyove, Ecurson, Quinee, ViiViiKay, & Exlura. Hurry! Limited time offers. Offers valid only while supplies last.